Are you a beginner who has just started to maintain and trim your stubble? Are you looking for a beard trimmer that not only helps you trim your stubble perfectly but is also easy to use and affordable? 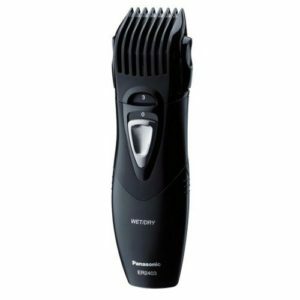 The Panasonic ER2403K503 Men’s Washable Beard Trimmer is one of the best choices for you to try and you will start feeling confident about your new look in no time. This trimmer from Panasonic gives you excellent control over your looks and makes you daring enough to try out new beard styles every day. You will be happy to find that you don’t have to stand before the mirror for long hours to get your sideburns and stubble right. With this high-performance trimmer from Panasonic, it takes minutes to get the right style. Read on through our beard trimmer review to understand more about the features and settings of this trimmer.